Cover art by the amazing Julie Dillon! LAST MAN OUT is coming soon! I’m currently in a final edit (with, like, an editor) and we’re shooting for a release sometime in the week of April 16th (later in the week is a little more likely). Audible has not gotten back to me yet on this one and I don’t want to take their decisions for granted, but naturally I’m hoping for an audio version. It won’t happen right away, though. The paperback will likely trail the ebook by a couple weeks. My usual formatting provider has stopped offering formatting services so I have to either find a new one or teach myself to do it. Yes, there will absolutely be another Good Intentions novel. I have a little of the next one written already, but I have no release dates in mind. I’m chewing on another, shorter, GI-like space opera, too. If you haven’t already, you will want to read NO MEDALS FOR SECRETS before this book! 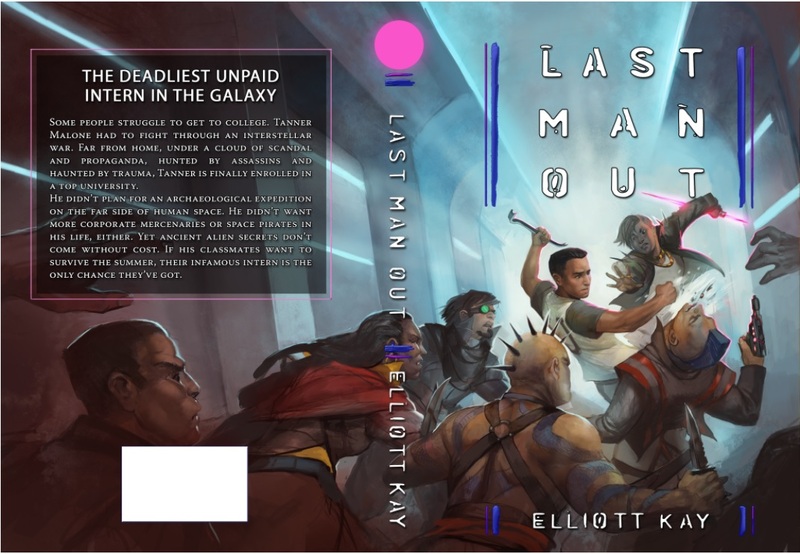 It’s totally possible to enjoy LAST MAN OUT without having read that one, but LMO includes a big payoff for the previous novel. In the meantime, if you haven’t visited it yet, you need to check out Julie Dillon’s website. Everything is a treat for your eyeballs. Go. Look. Hope to have more news and/or a full release for you very soon! That is my new favorite subtitle. And now with a proper release date I can stop obsessively checking your blog…until the week (probably later in the week) of April 16th. I don’t think about ‘sub-Titles’ enough to call it my favorite but other than that this post made me feel the exact same way Erik. (Now I just have to deal with the horrible wait between the 22nd and whenever it goes on sale). This gives me two weeks (or less) to reread the other 4 books in the series and get ready for this one to drop. I can’t wait! I like the GI series also, but this series might be my favorite by any author. Unfortunately, it doesn’t look like pre-order is available on Amazon yet. Now I want to speculate about all the things that might happen in this book. I hope Alicia took Vanessa’s suggestion and joined the intelligence community and that they both play a large role in this book with Tanner. Can’t wait to see how things shook out in Archangel either. Could Andrea be the new president or at least back in the Senate and on a committee dealing with intelligence issues? I’m guessing we’ll get to see a lot more of Allison too (I still can’t think of her as “Madelyn”). Allow me to add my thanks as well, I’ve really enjoyed reading everything you have written do date in this series. It has been a fun ride. I do look forward to (hopefully) paying you quite a few more times in the future. Whoohoo! Looking forward to this! Thanks, Elliott! I have read all the books and am definitely ready! Have you heard back from audible? And do you when will the hard copy be coming out? Paperback is taking a little work, unfortunately. My usual provider for formatting and cover adjustment & such shut down so I’m having to work it out on my own. Bit of a learning curve. But hopefully soon!